FlapJacked Mighty Muffins are carefully designed to provide balanced macros with quality and taste in mind. Each Mighty Muffin gives you 20g of protein, with under 20 net carbs and 10g of sugar or less. Just add water, stir and microwave for a hot, fresh muffin ready in under a minute! Chocolate lovers rejoice! This pack includes 4 Double Chocolate, 4 Chocolate Peanut Butter, 2 S'mores and 2 Tart Cherry Chocolate Mighty Muffins. Mighty macros! 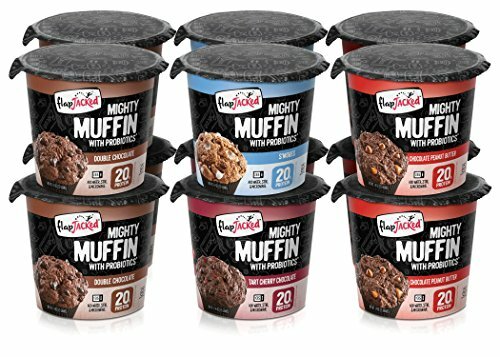 Each FlapJacked Mighty Muffin gives you 20g of protein, with under 20 net carbs and 10g of sugar or less. No artificial ingredients! Breakfast. Pre-workout. Post-workout. Second breakfast. Leg day. Late night dessert or midnight snack. Mighty Muffin fans eat them around the clock as a tastier alternative to protein bars, shakes or jerky. Ready in seconds! Just add water, stir and microwave. Adjust the cook time up or down by a few seconds for a more gooey or cake-like muffin experience. Issues with your order? Want tips on cooking? Looking for other flavors? We're happy to help in any way we can. Contact us if you aren't 100% satisfied and we'll make it right! If you have any questions about this product by FlapJacked, contact us by completing and submitting the form below. If you are looking for a specif part number, please include it with your message.